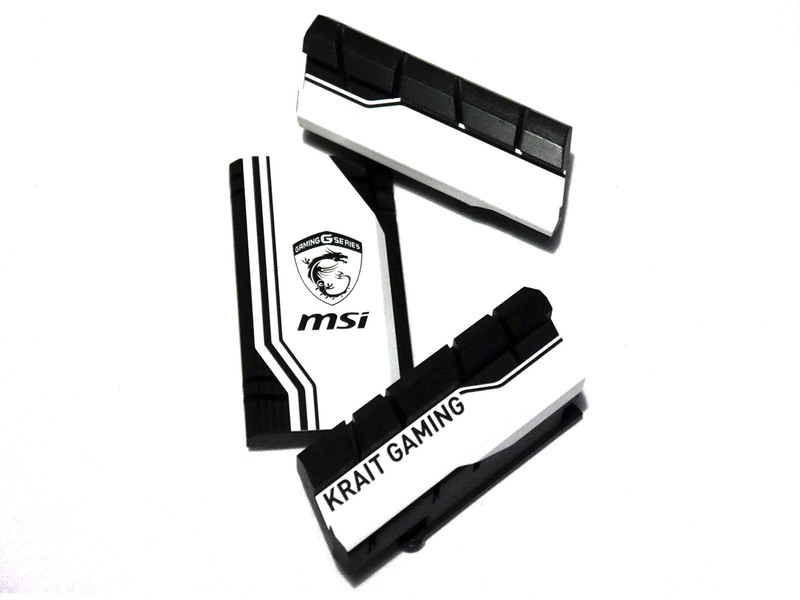 The KRAIT series was first brought into production in Z97 times, which was first known as the Z97S SLI KRAIT EDITION. This set the sights for a black and white themed motherboard, which people adored due to the previously never used colour combo. People seemed to love it, and MSI responded by that by rereleasing the KRAIT with a slightly different design and a new chipset from Intel, so that it is able to take the new Skylake CPUs and DDR4 memory. The black and white theme is something that has previously never been explored by any manufacturer (bar ECS, whom did a black, white and grey design in the P55 days). It gives those who mod and like something a little out of the ordinary something that stands out rather than blending into the rest of the mostly red and black themes. Besides a few chrome bits, the KRAIT series is entirely black and white PCB, and a deep black at that. Taking a quick glance, we can see the board in all its glory. One thing that immediately stands out to me is the SATA ports, which are not at a right angle, and that is a bit of a shame as that is something I feel is essential in today’s market, especially when the motherboard is in excess of £100. We won’t hold up at that, though, because the M.2 port, which is PCI-E based (via the PCH PCI-E lanes), is actually above all of the PCI-E lanes, which means your drive should remain cooler should you decide to use one. There are two main advantages that stick out immediately – longevity and performance. These drives run warm, so a bit of airflow from your CPU cooler (if you’ve got an air cooler) could work wonders, and it isn’t being blasted with as much heat from the GPU(s) either. It’s a win win situation, really. Moving in a little closer, we have the LGA 1151 socket that is fed by the VRM circuitry to the top and left of the socket. The VRM design on this particular motherboard consists of a eight phase design, which would be ample for any overclock that you could obtain out of an air or water (both AIO and custom) cooling system. Although the cooling for these voltage regulators isn’t overly big or complex, it should be just fine and you needn’t worry about them overheating. Since we are here, I may as well throw in a complimentary picture of the heat sinks on their own as well. There are no DDR3 slots present on the KRAIT. All four slots are DDR4 which means that they support up to a maximum of 64GB of RAM running at a maximum (overclocked) frequency of 3600 MHz. This may or may not be increased in the future, but for now, there aren’t too many modules that run at such high frequencies, and if you can afford them, you’d most likely be looking at a top-end tier motherboard rather than being closer to the entry level of hardware. You’ve got it; they’re somewhat expensive for such high-end modules, and rather unlikely to be used by many of us regular builders. Furthermore, we have the USB 3.0 header that is located just south of the 24 pin power, and two fan headers. Bizarrely enough, one of them is a CPU fan header and the other is a system fan header. I’d personally have thought the second CPU fan header would have been located a little closer to the socket, perhaps next to the other header, but that’s not the case with the KRAIT. As I mentioned previously, it is a shame to see that the SATA ports are not at right angles on the edge of the motherboard. If you haven’t already noticed it, there is a large, approximately one centimetre, segment of blank and unused PCB that is still attached. The reason for this is unclear to me, as it serves no purpose to the motherboard. However, it does make it appear as if it is a larger, fuller motherboard, which is the sense I get from it. We have a total of six SATA 6 Gbps ports altogether, which is a standard appearance on any Z170 motherboard as the chipset itself allows for a maximum of six ports natively. Finally, there are a couple of USB 2.0 headers visible towards the PCI-E expansion slots. Even though this is one of the cheaper MSI Z170 motherboards, the option for either SLI or CrossfireX is still present. The main two ports, both of which are linked to the CPU PCI-E lanes, are shielded by their new technology that is supposedly meant to make the signals more reliable and add a bit of strength to the slot at the same time, as an added bonus sort of thing. One thing which did strike me is the inclusion of a PCI slot. I was fairly sure that they had been eradicated from the face of the earth in recent generations, but they’re still lingering… apparently. There are three PCI-E x16 slots, but only two of them are connected to the CPU lanes. They run at x8/x8 when in a dual GPU configuration, and the third slot is driven by the PCH lanes. As only a dual (or quad if you have something like a 295X2 or TITAN Z (yeah, right!)) graphics are supported, it made sense to add one extra slot between the cards to allow for better breathing of the upper card. They run at least 10 degrees Celsius warmer than the bottom one in usual circumstances, so any added airflow and temperature reductions are welcomed any day of the year. Granted that this is a budget orientated motherboard, it is nice to see that the inputs and outputs on the KRAIT are still present and have not been dropped from the board. We have the usual PS/2 combination port which can be used for either a keyboard or a mouse (or both if you have an adapter) and two USB 2.0 ports beneath that. Just to the right of it, we have a DVI port and a HDMI port which provide us with our graphical outputs, and those are surrounded by six USB 3.0 (two of them are 3.1) ports as well as an Ethernet port that is powered by the Intel I129-V network chip. Last of all, we have the audio connections which consist of five ports and an optical S/PDIF as well. The audio on this motherboard is powered by a Realtek ALC1150 sound chip which is a fairly standard affair on motherboards in this particular price bracket. Previous articleSOMA – Alien: Isolation underwater with robots! Has the best mid-range motherboard on the new Intel Z270 chipset been found? Find out now in our ROG Maximus IX Hero Z270 motherboard review!